When I was a sophomore at Mainland High School in 1962-1963, we read Stephen Crane’s The Red Badge of Courage, but we were told nothing about Crane’s shipwreck on the shore of Daytona Beach in January 1897 or that he was taken to a house still standing today–the yellow house now called Lilian Place which faces the Halifax River on the northeast bank at the Orange Avenue Bridge. I will tell you that story, but first we’ll get the background of who Crane really was and what brought him to Daytona. Years after my graduation from Mainland I wrote a play about Crane and his shipwreck, and I will use that play for writing this piece. (I recall that I relied heavily on R. W. Stallman’s Stephen Crane, a Biography, but I no longer know the other sources from which I gathered these stories). As a fully grown man Crane stood only 5 feet 6 inches tall, and weighed 120 pounds. He had sandy hair and sallow skin. He loved to smoke, loved to drink, and he was on his way–as the Bible says–on the path to perdition. But first, Crane had a lay-over in Daytona. This is where Stephen Crane almost died. The topic of this blog posting, though, will be limited to the time before Crane was shipwrecked here on Daytona Beach. Stevie–as the family called him–was only four years old when he paddled naked into the Raritan River in his home state of New Jersey and almost drowned. His mother was 45 when she gave birth to Stephen, her fourteenth child, but only eight were still living when he was born, and that was 22 years after her first baby. She did not live to see Crane’s success as a writer; he himself lived to be only 28 years, 7 months old, and his mother died when he was only 20. Six years later he would be in Daytona. His sister Agnes who said, “I am my mother’s ugly duckling,” cared for little Stevie and the other children, and she loved to comb the long curls of Stevie’s hair which was never cut until he was 8 years old. Agnes also died young at 28 when he was only 13. Before Stephen was born his Methodist parson father had written Popular Amusements (1869), a book that condemns the reading of novels because such writing “creates an overgrowth of passions” and “a morbid love of excitement.” He also wrote a book against tobacco, alcohol, and opium–Arts of Intoxication which sold 4,000 copies. His son, Stephen, took many, if not all, of these excitements to heart; and he smoked, drank alcohol to excess, and generally hurried his death. Crane failed at Lafayette College, and at Syracuse University he cared more about playing shortstop and catching on the varsity baseball team than he did studying, but after dropping out of the university, Crane wrote Maggie, A Girl of the Streets (1893), which because of its coarse language and illicit topic was unacceptable to any publisher, so Crane, aged 22, paid for the publication. The next year Crane’s classic novel of the American Civil War The Red Badge of Courage was serialized in the Philadelphia Press and was published in book form in 1895. In November of the next year as a New York Journal reporter for William Randolph Hearst, Crane was scheduled to embark for Cuba to write about the insurrectionist war, but he postponed his voyage one week to defy superstition, intentionally sailing on Friday the 13th. Within a few days he was spending time with Cora Taylor in Jacksonville. By that time The Red Badge of Courage had gone through 14 printings, and Crane was famous throughout the world. His now little-known novel The Third Violet had also been published in May, his book of poetry The Black Riders had just come out the month before, and his book of Civil War short stories The Little Regiment was due out in the coming month. Crane was only 25 years old and smothered with success, but he would not live another four years. 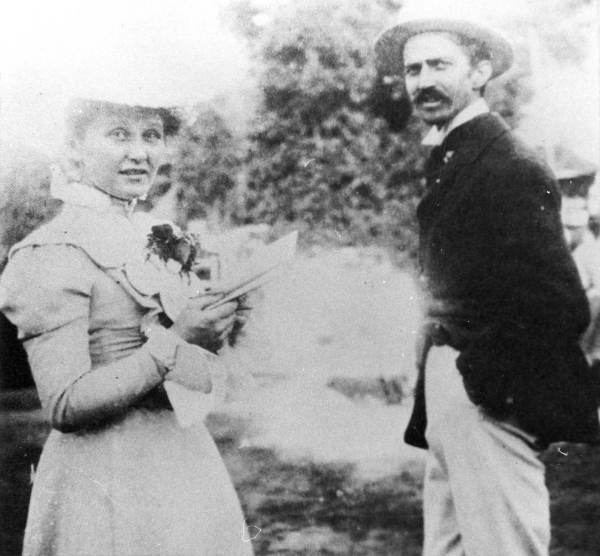 Before meeting Stephen Crane, Cora Taylor, though a young woman, had married four or possibly five times, so that by 1896, the year they met, it would not have been entirely incorrect to have considered her to be Cora Ethel Eton Howorth Murphy Stewart Taylor–the madam of Hotel de Dreme, Jacksonville’s most popular house of ill-repute on Ashley Street which was only five blocks from Ward Street (now Houston Street) where most of the other bordellos were; and more important, Cora’s “5-star rated” establishment was near the St. James Hotel where Stephen Crane was registered under the alias Stephen Carleton. Crane was 90 miles north of Daytona late in 1896, waiting to join an expedition to run guns and ammunition to the insurrectionists in Cuba. Seventy other expeditions had already been planned, but only 27 had actually reached Cuba. Crane was eager to get there himself, and he was well-prepared with $700 in gold in a money belt (equivalent to at least $16,900 today). Crane had to strip off his money belt near the shoreline to try to keep from drowning with its weight as the waves plunged him toward the shore of Daytona Beach. Very interesting story, Mr. Bowden. I have enoyed all your posts. As a resident of Flagler County, I am happy to become acquainted with the history of our area. Thank you for your research. Hi Denny, I shared the link with the New Smyrna Museum of History Facebook page. I am looking forward to the second part of the story. The link to the Lilian Place House offers an interesting video.